Numerous studies have indicated that inflammatory cytokines play a major role in osteoclastogenesis, leading to the bone resorption that is frequently associated with cancers and other diseases. Gene deletion studies have shown that receptor activator of NF-κB ligand (RANKL) is one of the critical mediators of osteoclastogenesis. How RANKL mediates osteoclastogenesis is not fully understood, but an agent that suppresses RANKL signaling has potential to inhibit osteoclastogenesis. In this report, we examine the ability of curcumin (diferuloylmethane), a pigment derived from turmeric, to suppress RANKL signaling and osteoclastogenesis in RAW 264.7 cells, a murine monocytic cell line. Treatment of these cells with RANKL activated NF-κB, and preexposure of the cells to curcumin completely suppressed RANKL-induced NF-κB activation. Curcumin inhibited the pathway leading from activation of IκBα kinase and IκBα phosphorylation to IκBα degradation. RANKL induced osteoclastogenesis in these monocytic cells, and curcumin inhibited both RANKL- and TNF-induced osteoclastogenesis and pit formation. Curcumin suppressed osteoclastogenesis maximally when added together with RANKL and minimally when it was added 2 days after RANKL. Whether curcumin inhibits RANKL-induced osteoclastogenesis through suppression of NF-κB was also confirmed independently, as RANKL failed to activate NF-κB in cells stably transfected with a dominant-negative form of IκBα and concurrently failed to induce osteoclastogenesis. 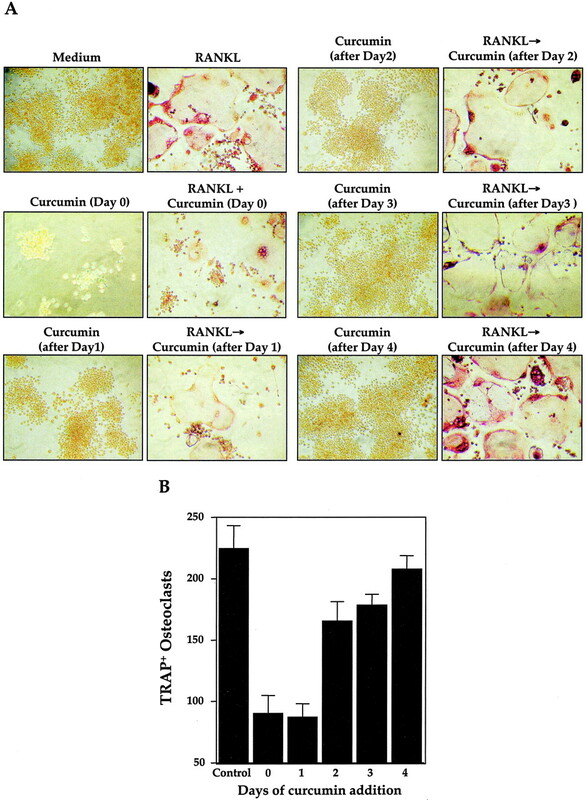 Thus overall these results indicate that RANKL induces osteoclastogenesis through the activation of NF-κB, and treatment with curcumin inhibits both the NF-κB activation and osteoclastogenesis induced by RANKL. Osteoclasts are multinucleated cells formed by the fusion of mononuclear progenitors of the monocyte/macrophage family and are the major resorptive cell of bone (1). In vitro maturation of macrophages into osteoclasts requires the presence of stromal cells or their osteoblast progeny (2). Extensive research in the last few years has indicated that these accessory cells express M-CSF and receptor for activation of NF-κB (RANK)3 ligand (RANKL) and these are essential and sufficient to promote osteoclastogenesis. Besides M-CSF and RANKL, several other inflammatory cytokines and osteotropic agents including TNF and IL-1β have been implicated in osteoclastogenesis, most likely through the osteoblastic modulation of RANKL, its decoy receptor osteoprotegerin (OPG), and M-CSF (3, 4). The effects of parathyroid hormone and lipopolysaccharides on osteoclastogenesis are also mediated through expression of RANKL. RANKL is a member of the TNF superfamily (5) that interacts with the cell surface receptor RANK, which in turn recruits TNFR-associated factors (TRAF)1, 2, 3, 5, and 6 (6, 7). By receptor deletion analysis, we and others have shown that sequential recruitment of TRAF6 and NF-κB-inducing kinase by RANK leads to NF-κB activation, and recruitment of TRAF2 leads to c-Jun N-terminal kinase (JNK) activation (8, 9). That RANK can mediate osteoclastogenesis was first demonstrated by Hsu et al. (10). Further gene-deletion analysis of RANK, RANKL, and TRAF6 showed that these genes are positive regulators of osteoclastogenesis (11, 12, 13), whereas OPG, a decoy receptor for RANKL, was found to be a negative regulator of this process (14, 15). Gene-deletion analysis also suggested a critical role of M-CSF, c-fms (M-CSF receptor), and Src in osteoclastogenesis (16, 17, 18). Although RANKL is known to activate NF-κB, JNK, and p38 and p44/p42 mitogen-activated protein kinase (5, 9, 19, 20), how this cytokine mediates osteoclastogenesis is not fully understood. Furthermore agents that can suppress RANKL signaling can suppress osteoclastogenesis-induced bone loss. Curcumin, a diferuloylmethane derived from turmeric (Curcuma longa), has been shown to suppress proliferation of a wide variety of tumor cells; to down-regulate transcription factors NF-κB, AP-1, and early growth response gene-1; to suppress the expression of cyclooxygenase-2, lipoxygenase, NO synthase, matrix metalloproteinase-9, urokinase-type plasminogen activator, TNF, chemokines, cell surface adhesion molecules and cyclin D1; to inhibit the expression of growth factor receptors (such as epidermal growth factor receptor and human epidermal growth factor receptor 2); and to inhibit the activity of JNK, protein tyrosine kinases, and several other protein serine/threonine kinases (21). This polyphenol has antioxidant and anti-inflammatory activity and found to suppress tumor initiation, promotion, and metastasis. The effect of curcumin has been shown by us and others to suppress NF-κB activation induced by various inflammatory stimuli (22, 23, 24), inhibit the activation of IκB kinase (IKK) needed for NF-κB activation (25, 26, 27), and found to be safe in humans even at 8 g per day (28), and we examined the effect of curcumin on RANKL-induced NF-κB activation and on osteoclastogenesis in osteoclast precursor cells. We demonstrate that RANKL induces NF-κB activation through activation of IKK and IκBα phosphorylation and degradation, and curcumin inhibits RANKL-induced NF-κB activation and osteoclastogenesis. The critical role of NF-κB in this process was further confirmed by using a dominant-negative form of IκBα. The rabbit polyclonal Abs to IκBα, p50, p65, cyclin D1, were purchased from Santa Cruz Biotechnology (Santa Cruz, CA). Ab against phospho-IκBα was purchased from Cell Signaling Technology (Beverly, MA). Anti-IKK-α and anti-IKK-β Abs were kindly provided by Imgenex (San Diego, CA). Goat anti-rabbit HRP conjugate was purchased from Bio-Rad (Hercules, CA), goat anti-mouse HRP and BioCoat Osteologic Bone Cell Culture System from BD Biosciences (San Jose, CA), and MTT from Sigma-Aldrich (St. Louis, MO). Curcumin with a purity >98% was purchased from LKT Laboratories (St. Paul, MN) and was prepared as a 20 mM solution in DMSO and then further diluted in cell culture medium. DMEM-F12, FBS, 0.4% trypan blue vital stain, and antibiotic-antimycotic mixture were obtained from Invitrogen (Carlsbad, CA). Protein A/G-Sepharose beads were obtained from Pierce (Rockford, IL). [γ-32P]ATP was from ICN Pharmaceuticals (Costa Mesa, CA). Highly purified recombinant murine TNF-α was provided by Genentech (South San Francisco, CA). The mouse macrophage cell line RAW 264.7 was obtained from American Type Culture Collection (Manassas, VA). RAW 264.7 cells were cultured in DMEM-F12 medium supplemented with 10% FBS and antibiotics. This cell line has been shown to express RANK and differentiate into tartrate resistance acid phosphatase (TRAP)-positive, functional osteoclasts when cocultured with bone slices or soluble RANKL (10). Moreover, RANKL has been shown to activate NF-κB in these cells (29). TRAP staining was performed using a leukocyte acid phosphatase kit (387-A) from Sigma-Aldrich. The plasmid pCMV4-Flag-IκBα-DN (lacking residues 1–36) was kindly provided by Dr. D. W. Ballard (Vanderbilt University School of Medicine, Nashville, TN) (30, 31). The tetracycline inducible expression vector pEC 1214A was generously provided by Dr. H.-J. Xu (University of Texas M.D. Anderson Cancer Center, Houston, TX) (32). We constructed a tetracycline inducible FLAG-tagged IκBα-dominant negative (DN) by inserting a HindIII-BamHI fragment from pCW4-Flag-IκBα-DN into the HindIII-BamHI site of pEC 1214A, and the resulting plasmid was named pTet-Flag-IκBα-DN. The expression vector of full-length murine RANKL with a TNF-related activation-induced cytokine (pcDNA 3.1-TRANCE) was generously provided by Y. Choi (Rockefeller University, New York, NY). To generate a bacterial expression vector for RANKL, we used specific 5′ and 3′ primers with HindIII and NotI sites, respectively, to amplify the DNA, which encodes residues 157–316 of RANKL from the pcDNA3.1-TRANCE template. The PCR product was digested with HindIII-NotI and ligated in-frame with a hemagglutinin tag (N-terminal) and a histidine tag (C-terminal) into the expression vector pHB6. Soluble RANKL was expressed and purified using Ni-agarose. RAW 264.7 cells were plated at 0.5 × 106 cells/well on six-well plates and transfected the next day with pTet-Flag-IκBα-DN (2.5 μg total DNA) using 9 μl of Fugene 6. After 48 h, cells were trypsinized and plated in 100-cm dishes in the presence of G418 (600 μg/ml) and tetracycline (1 μg/ml). Single colonies were isolated after 2 wk of G418 selection, expanded, and examined for expression of Flag-tagged IκBα-DN in the absence of tetracycline. RAW 234.7 cells were cultured in 24-well dishes at a density of 1 × 104 cells per well and were allowed to adhere overnight. Medium was then replaced and the cells were treated with 5 nM (∼100 ng/ml) RANKL. At day 5, cultures were stained for TRAP expression as described (33) using an acid phosphatase kit, and the total number of TRAP-positive multinucleated osteoclasts (>3 nuclei) per well were counted. To determine whether RANKL induces osteoclastogenesis in bone marrow-derived macrophages, cells were isolated from the femur bone of the mice. These bone marrow-derived macrophages (1 × 104 cells/well) were pretreated with curcumin (10 μM) for 2 h and then exposed to M-CSF (100 ng/ml) either alone or in the presence of indicated concentrations of RANKL. After 5 days, cells were stained for TRAP expression. This assay was performed as described (34). To determine the effect of curcumin on pit formation, RAW 264.7 cells were seeded into each well of calcium phosphate apatite-coated plates (BioCoat Osteologic Bone Cell Culture System; BD Biosciences) in culture medium, and then pretreated with curcumin (10 μM) for 2 h, before adding either RANKL (5 nM) or TNF (1 nM). After 5 days incubation, all remaining cells were lysed using 1 N NaOH. The images of the resorbed pits were obtained under light microscopy. Nuclear extracts were prepared as described earlier (24). Briefly, 2 × 106 RAW 264.7 cells were washed with cold PBS, scraped, and suspended in 0.1 ml of hypotonic lysis buffer containing protease inhibitors for 30 min. The cells were then lysed with 3.2 μl of 10% Nonidet P-40. The homogenate was centrifuged, and supernatant containing the cytoplasmic extracts was stored frozen at −80°C. The nuclear pellet was resuspended in 25 μl ice-cold nuclear extraction buffer. After 30 min of intermittent mixing, the extract was centrifuged, and supernatants containing nuclear extracts were secured. The protein content was measured by the Bradford method. If the extracts were not used immediately, they were stored at −80°C. NF-κB activation was analyzed by EMSA as previously described (35). In brief, 8 μg of nuclear extracts prepared from curcumin-treated or untreated cells were incubated with 32P end-labeled 45-mer double-stranded NF-κB oligonucleotide from HIV-I long-terminal repeat (5′-TTGTTACAAGGGACTTTCCGCT GGGGACTTTCCAG GGAGGCGTGG-3′) for 30 min at 37°C, and the DNA-protein complex resolved in a 6.6% native polyacrylamide gel. The radioactive bands from the dried gels were visualized and quantitated by the PhosphorImager (Molecular Dynamics, Sunnyvale, CA) using ImageQuant software. Cytoplasmic protein extracts (30–40 μg) were resolved on 10% SDS-PAGE. After electrophoresis, the proteins were electrotransferred to a nitrocellulose membrane, blocked with 5% nonfat milk, and probed with Abs against either IκBα, phospho-IκBα, IKK-α, IKK-β, or β-actin (1:3000) for 1 h. Thereafter, the blot was washed, exposed to HRP-conjugated secondary Abs for 1 h, and finally detected by ECL (Amersham Pharmacia Biotech, Arlington Heights, IL). The IKK assay was performed by a modified method as described earlier (36). Briefly, 200 μg of cytoplasmic extracts were immunoprecipitated with 1 μg of anti-IKK-α and anti-IKK-β Abs each, and the immune complexes so formed were precipitated with 0.01 ml of protein A/G-Sepharose beads for 2 h. The beads were washed first with lysis buffer and then with the kinase assay buffer (50 mM HEPES pH 7.4, 20 mM MgCl2, and 2 mM DTT). The immune complex was then assayed for kinase activity using kinase assay buffer containing 20 μCi [γ-32P]ATP, 10 μM unlabeled ATP, and 2 μg/sample GST IκBα (aa 1–54). After incubation at 30°C for 30 min, the mixture was boiled with 6× SDS sample buffer to stop the reaction. The reaction mixture was resolved on 12% SDS-PAGE. The radioactive bands of the dried gel were visualized and quantitated by PhosphorImager. To determine the total amount of IKK-α and IKK-β in each sample, 60 μg of the cytoplasmic protein was resolved on a 7.5% acrylamide gel, and Western blot analysis was performed. We investigated the effect of curcumin on RANKL-induced NF-κB activation and on osteoclastogenesis in the murine monocytic cell line RAW 264.7. To determine the effect of curcumin on RANKL-induced NF-κB activation in RAW 264.7 cells, we first incubated these cells with curcumin for 2 h and then treated them with RANKL, prepared nuclear extracts, and assayed NF-κB activation by EMSA. RANKL activated NF-κB maximally within 15 min, and curcumin completely abrogated the RANKL-induced NF-κB activation (Fig. 1⇓A). The inhibition of NF-κB by curcumin increased with dose. Complete inhibition was observed at a 50 μM concentration of curcumin (Fig. 1⇓B). Supershift assay of NF-κB-DNA probe binding showed that RANKL-activated NF-κB consisted of p65 and p50 subunits (Fig. 1⇓C). Reaction mixtures containing Abs to p50 or p65 showed either lesser NF-κB-DNA complex (with anti-p50) or a further shift in the NF-κB-DNA complex band (with anti-p65). The specificity of the RANKL-induced NF-κB-DNA complex was further confirmed by demonstrating that the binding was unaffected by irrelevant Ab (anti-cyclin D1) and was abolished by the presence of a 100-fold excess of unlabeled κB-oligonucleotides. RANKL induces NF-κB activation and curcumin inhibits it in dose- and time-dependent manner. A, RAW 264.7 cells (1 × 106 cells) were either incubated alone or in the presence of curcumin (50 μM) for 2 h, treated with RANKL (10 nM) for the indicated times, and then tested for nuclear NF-κB by EMSA as described. B, RAW 264.7 cells (1 × 106 cells) were incubated without or with the indicated concentrations of curcumin for 2 h and then treated with RANKL (10 nM) and tested for nuclear NF-κB by EMSA as described. C, The binding of NF-κB is specific and consists of p50 and p65 subunits. Nuclear extracts were prepared from untreated RAW 264.7 cell or the cells treated with RANKL, incubated for 15 min with different Abs or unlabeled oligonucleotide probe, and then assayed for NF-κB by EMSA in 5% gel. Activation of NF-κB by most agents requires phosphorylation and degradation of its inhibitory subunit IκBα. To investigate the mechanism involved in the inhibition of NF-κB activation by curcumin, we first checked the effects of curcumin treatment on the levels of IκBα by Western blot analysis. The IκBα level dropped down within 10 min in the cells treated with RANKL, and returned to normal levels within 60 min of treatment (Fig. 2⇓A, left). The upper minor band is probably due to overwhelming signals from IκBα seen in the lower band. 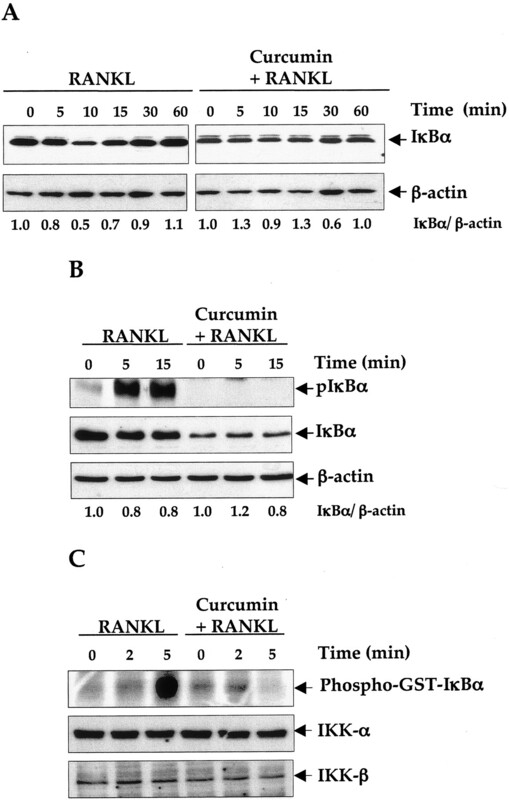 In contrast, cells pretreated with curcumin suppressed RANKL-induced IκBα degradation (Fig. 2⇓A, right). Next we investigated the effect of curcumin on the RANKL-induced phosphorylation of IκBα, which occurs before its dissociation, ubiquitination, and degradation (37). Western blot analysis for phospho-IκBα in Fig. 2⇓B clearly indicates that RANKL induced IκBα phosphorylation in RAW 264.7 cells and that curcumin eliminated the RANKL-induced phosphorylation. Treatment of cells with curcumin alone did not result in phosphorylation of IκBα. It is noticeable that the content of IκBα in curcumin-treated sample was lesser than the control; quantitating of IκBα to β-actin ratio indicates that curcumin treatment down-regulates the expression of IκBα and inhibits the RANKL-induced degradation of IκBα. Curcumin inhibits RANKL-induced IκBα phosphorylation and degradation through inhibition of IKK activity. RAW 264.7 cells (1 × 106 cells) were either incubated alone or in the presence of curcumin (50 μM) for 2 h and then treated with RANKL (10 nM) for the indicated times; cytoplasmic extracts were prepared to check the following: the level of IκBα (A); the level of phosphorylated IκBα by Western blot analysis (B); IKK activity (C, upper); immunoprecipitated IKK and performed the kinase assay, and total IKK-α and IKK-β proteins by Western blot analysis (middle and lower) in cytoplasmic extracts. Quantitation of IκBα after normalization with β-actin (A and B) is presented. Because IKK phosphorylates IκBα (38), we next checked whether curcumin alters the activity or the levels of IKK. In in vitro IKK assay, cells treated with RANKL showed a sharp rise in IKK activity as indicated by the phosphorylation of GST-IκBα within 5 min. In contrast, cells pretreated with curcumin could not phosphorylate GST-IκBα upon RANKL treatment (Fig. 2⇑C, upper panel). To check whether the apparent loss of IKK activity was due to the loss of IKK protein expression, the expression levels of the IKK subunits IKK-α and IKK-β were tested by Western blot analysis. Results in Fig. 2⇑C (middle and lower panels) clearly showed that curcumin treatment did not alter the expression of IKK-α or IKK-β. Next we investigated the effect of curcumin on osteoclastogenesis. RAW 264.7 cells were incubated with different concentrations of curcumin in the presence of RANKL and allowed to grow and differentiate into osteoclasts. Fig. 3⇓A illustrates that RANKL induced osteoclasts both in the presence and absence of curcumin. However, the number of osteoclasts decreased with increasing concentration of curcumin (Fig. 3⇓B). Curcumin inhibits RANKL-induced osteoclastogenesis. RAW 264.7 cells (1 × 104 cells) were incubated either alone or in the presence of RANKL (5 nM) without or with curcumin for 5 days and stained for TRAP expression. A, TRAP-positive cells were photographed (original magnification, ×100). B, Multinucleated (>3 nuclei) osteoclasts were counted (error bar indicates SD). C, Curcumin inhibits RANKL-induced and TNF-induced pit formation. RAW 264.7 (3 × 103 cells) cells were seeded into calcium phosphate apatite-coated plates, treated with 10 μM curcumin for 2 h, and then with either 5 nM RANKL or 1 nM murine TNF. After 5 day incubation, cells were lysed, and images obtained under light microscopy. D, Curcumin inhibits RANKL-induced osteoclastogenesis in bone marrow-derived macrophages. Bone marrow-derived macrophages (1 × 104 cells) were incubated with M-CSF (100 ng/ml) either alone or in the presence of indicated concentrations of RANKL either with or without curcumin for 5 days and then stained for TRAP expression. Multinucleated (>3 nuclei) osteoclasts were counted (error bar indicates SD). Whether inhibition of RANKL-induced osteoclastogenesis by curcumin leads to inhibition of pit formation was investigated. To determine this, RAW 264.7 cells were seeded into calcium phosphate apatite-coated plates, treated with curcumin, along with RANKL, and then the pit formation was analyzed after 5 days. Result showed that RANKL induced pit formation and this was significantly suppressed by curcumin (Fig. 3⇑C, middle panels). Besides RANKL, TNF has also been shown to induce osteoclastogenesis (1). Whether TNF-induced pit formation is inhibited by curcumin, was also investigated. Like RANKL, result showed that murine TNF induced pit formation and this was significantly suppressed by curcumin (Fig. 3⇑C, bottom panels). Thus these results suggest that curcumin suppressed not only osteoclastogenesis, but also pit formation. Whether curcumin inhibits the RANKL-induced osteoclastogenesis in mouse bone marrow-derived macrophages was also investigated. Fresh mouse bone marrow-derived macrophages were incubated with curcumin in the presence of different concentrations of RANKL and allowed to grow and differentiate into osteoclasts. Fig. 3⇑D shows that RANKL induced osteoclast formation, and curcumin suppressed it in a dose-dependent manner. It normally takes up to 5 days for RAW 264.7 cells to differentiate into osteoclasts in response to RANKL. To determine how early in this pathway curcumin acts, we treated the RAW 264.7 cells with RANKL, added curcumin on different days, and then checked its effect on osteoclast formation. Curcumin inhibited osteoclastogenesis even when the cells were exposed 24 h after the RANKL treatment (Fig. 4⇓). However the inhibitory effect decreased significantly when cells were treated with curcumin 2 days after RANKL treatment. Curcumin effectively inhibits RANKL-induced osteoclastogenesis 24 h after stimulation. RAW 264.7 cells (1 × 104 cells) were incubated either alone or in the presence of RANKL (5 nM), and curcumin (10 μM) was added at the same time or after indicated time periods. Cells were cultured for 5 days after RANKL treatment and stained for TRAP expression. A, Photographs of cells (original magnification, ×100). B, Multinucleated (>3 nuclei) osteoclasts were counted. Values indicate mean of total osteoclasts in triplicate cultures (error bar indicates SD). Besides NF-κB activation, RANKL is known to activate several other signals in the cell. It is possible that curcumin inhibits RANKL-induced osteoclastogenesis by suppressing signals other than NF-κB. To establish that curcumin suppressed osteoclastogenesis by inhibiting NF-κB activation, we generated RAW 264.7 cells stably transfected with plasmid construct containing IκBα-DN. RANKL activated NF-κB in wild-type cells but not in IκBα-DN expressing cells (Fig. 5⇓A). RANKL also failed to induce osteoclastogenesis in IκBα-DN expressing RAW cells (Fig. 5⇓B), i.e., in cells that did not respond to NF-κB activation. These results suggest the critical role of NF-κB activation in RANKL-induced osteoclastogenesis. RANKL-induced NF-κB activation is essential for RANKL-induced osteoclastogenesis. RAW 264.7 wild-type (WT) or IκBα-dominant negative (lκBα-DN) stably transfected cells are shown. A, A total of 1 × 106 cells were incubated alone or in the presence of RANKL (10 nM) or TNF (1 nM) for 30 min and tested for nuclear NF-κB by EMSA as described. B, A total of 1 × 104 cells were treated in the absence or presence of RANKL (5 nM) for 5 days, TRAP-stained, and checked for osteoclastogenesis. In the present study we used a homogeneous, clonal population of murine monocytic cells RAW 264.7 to define the direct effect of curcumin on osteoclast development induced by RANKL. The advantage of this system is that it does not contain any osteoblast/bone marrow stromal cells or cytokine like M-CSF and allows us to focus on RANK signaling in preosteoclast cells. In our study curcumin inhibited RANKL-mediated NF-κB activation by inhibiting IKK activity and it prevented osteoclast formation. We also found that curcumin inhibited the initial phase of cell growth by RANKL that is required for cell fusion and formation of a multinucleated cell. The critical role of NF-κB in RANKL-induced osteoclastogenesis was further confirmed by the use of IκBα-DN. Our results indicate that RANKL activates NF-κB in osteoclastic precursor cells through the activation of IKK and subsequent IκBα phosphorylation and degradation. These results are in agreement with those of Wei et al. (29). We also showed that curcumin inhibits RANKL-induced IKK activation, leading to the suppression of NF-κB activation. The mechanism of NF-κB activation induced by RANKL differs from that of TNF. For instance NF-κB-inducing kinase, although required for RANKL-induced NF-κB activation (39), is dispensable for TNF-induced NF-κB activation (40). Although curcumin has been shown to suppress TNF-induced IKK activation (25, 26), ours is the first report to suggest that curcumin can also suppress RANKL-induced NF-κB activation. This is in agreement with our recent results that curcumin inhibits NF-κB activation, not by inhibiting upstream kinase to IKK but by inhibiting IKK directly (24). We also found that suppression of NF-κB activation by curcumin correlated with inhibition of osteoclastogenesis. Whether NF-κB activation is needed for osteoclastogenesis is controversial. Although not all the cytokines that activate NF-κB induce osteoclastogenesis, other evidence suggests that activation of NF-κB is essential for osteoclast development (29, 41, 42, 43, 44, 45). p50 and p52 Double knockout mice showed defects in osteoclastogenesis and severe osteopetrosis (41). Results presented in this study show that NF-κB activation is critical for RANKL-induced osteoclastogenesis. It is possible that the inhibitory effect of curcumin on osteoclastogenesis is not mediated through suppression of NF-κB. This is unlikely, however, as we also found that RAW 264.7 cells transfected with a dominant-negative form of IκBα, which as a result could not activate NF-κB in response to RANKL, did not differentiate into multinucleated osteoclasts. We show in this study for the first time that curcumin can inhibit the formation of osteoclasts. Curcumin has been shown to induce apoptosis in osteoclasts (46). It is possible that apoptotic effects of curcumin are responsible for suppression of osteoclastogenesis. We think this is unlikely, however, because we found that growth inhibitory effects of curcumin were reversed by RANKL (our unpublished observation). Besides, RAW 264.7 cells transfected with IκBα-DN failed to activate NF-κB and were also unable to differentiate to osteoclasts in response to RANKL. Our group showed that stimulation of RANK also results in activation of JNK activity along with NF-κB (6). Recently, JNK has also been implicated in osteoclastogenesis (47). Curcumin can effectively inhibit JNK activity (48), so it is possible that JNK activity is also affected by curcumin in osteoclast precursors and may synergize with inhibition of NF-κB activation. 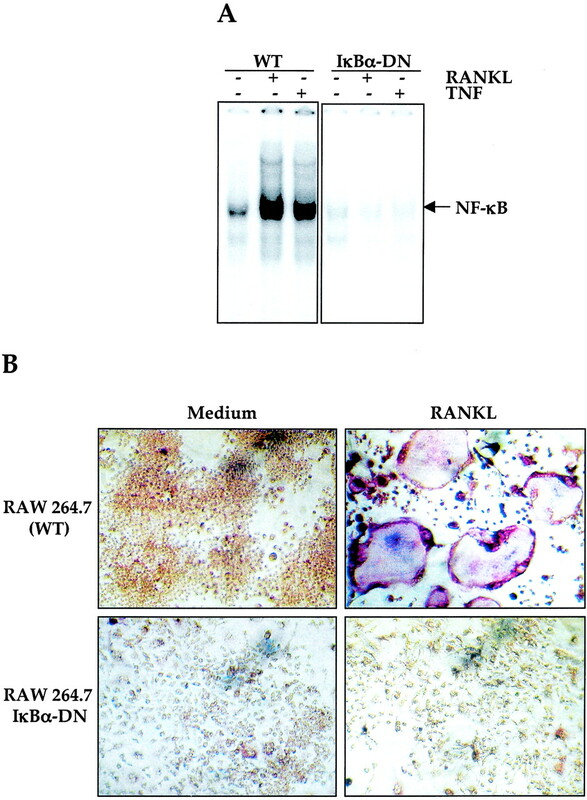 That RAW 264.7 cells, which lacked RANKL-induced NF-κB activation, failed to differentiate to osteoclasts suggests that NF-κB plays a major role. Recently several cytokines have been reported that can suppress RANKL-induced osteoclastogenesis. These include IFN-β, IFN-γ, and IL-4, (29, 49, 50, 51, 52). All these cytokines mediate their effects through different mechanisms; for instance, IFN-γ induces the degradation of TRAF6 through ubiquitination-dependent pathway; IFN-β down-regulates c-fos expression; and IL-4 down-regulates NF-κB activation (53) through a STAT6-dependent mechanism (50). Our results show that curcumin inhibits osteoclastogenesis through inhibition of NF-κB. As indicated by epidemiologic evidence, and by several phase I clinical trials, curcumin is pharmacologically safe in humans (28). Curcumin is being investigated for its anticancer activity in breast cancer and multiple myeloma and has provided encouraging results both in vitro and in vivo (24, 54, 55). That curcumin could be used in the treatment of secondary bone lesions associated with breast cancer and multiple myeloma and those associated with nonmalignant diseases like postmenopausal osteoporosis, Paget’s disease and rheumatoid arthritis in which severe osteolytic activity is observed (56) has great promise. We thank Walter Pagel for his critical review of this manuscript. We also thank Dr. Bryant Darnay for dominant-negative IκBα-transfected RAW 264.7 cells and for RANKL protein. ↵1 This work is supported by the Clayton Foundation for Research (to B.B.A. ), by Department of Defense, U.S. Army Breast Cancer Research Program Grant BC010610 (to B.B.A. ), by PO1 Grant CA91844 from the National Institutes of Health on lung chemoprevention (to B.B.A. ), and by a P50 Head and Neck Specialized Program of Research Excellence Grant from the National Institutes of Health (to B.B.A.). B.B.A. is Ransom Horne Distinguished Professor of Cancer Research. ↵3 Abbreviations used in this paper: RANK, receptor activator of NF-κB; RANKL, RANK ligand; OPG, osteoprotegerin; TRAF, TNFR-associated factor; IKK, IκB kinase; TRAP, tartrate resistance acid phosphatase; IκBα-DN, dominant negative IκBα mutant; JNK, c-Jun N-terminal kinase. Teitelbaum, S. L.. 2000. Bone resorption by osteoclasts. Science 289:1504. Udagawa, N., N. Takahashi, T. Akatsu, H. Tanaka, T. Sasaki, T. Nishihara, T. Koga, T. J. Martin, T. Suda. 1990. Origin of osteoclasts: mature monocytes and macrophages are capable of differentiating into osteoclasts under a suitable microenvironment prepared by bone marrow-derived stromal cells. Proc. Natl. Acad. Sci. USA 87:7260. Yao, G. Q., B. Sun, E. E. Hammond, E. N. Spencer, M. C. Horowitz, K. L. Insogna, E. C. Weir. 1998. The cell-surface form of colony-stimulating factor-1 is regulated by osteotropic agents and supports formation of multinucleated osteoclast-like cells. J. Biol. Chem. 273:4119. Rubin, J., X. Fan, D. Thornton, R. Bryant, D. Biskobing. 1996. Regulation of murine osteoblast macrophage colony-stimulating factor production by 1,25(OH)2D3. Calcif. Tissue Int. 59:291. Darnay, B. G., B. B. Aggarwal. 1999. Signal transduction by tumour necrosis factor and tumour necrosis factor related ligands and their receptors. Ann. Rheum. Dis. 58:(Suppl. 1):I2. Darnay, B. G., V. Haridas, J. Ni, P. A. Moore, B. B. Aggarwal. 1998. Characterization of the intracellular domain of receptor activator of NF-κB (RANK): interaction with tumor necrosis factor receptor-associated factors and activation of NF-κB and c-Jun N-terminal kinase. J. Biol. Chem. 273:20551. Wong, B. R., R. Josien, S. Y. Lee, M. Vologodskaia, R. M. Steinman, Y. Choi. 1998. The TRAF family of signal transducers mediates NF-κB activation by the TRANCE receptor. J. Biol. Chem. 273:28355. Darnay, B. G., J. Ni, P. A. Moore, B. B. Aggarwal. 1999. Activation of NF-κB by RANK requires tumor necrosis factor receptor-associated factor (TRAF) 6 and NF-κB-inducing kinase: identification of a novel TRAF6 interaction motif. J. Biol. Chem. 274:7724. Lee, S. Y., A. Reichlin, A. Santana, K. A. Sokol, M. C. Nussenzweig, Y. Choi. 1997. TRAF2 is essential for JNK but not NF-κB activation and regulates lymphocyte proliferation and survival. Immunity 7:703. Hsu, H., D. L. Lacey, C. R. Dunstan, I. Solovyev, A. Colombero, E. Timms, H. L. Tan, G. Elliott, M. J. Kelley, I. Sarosi, et al 1999. Tumor necrosis factor receptor family member RANK mediates osteoclast differentiation and activation induced by osteoprotegerin ligand. Proc. Natl. Acad. Sci. USA 96:3540. Kong, Y. Y., H. Yoshida, I. Sarosi, H. L. Tan, E. Timms, C. Capparelli, S. Morony, A. J. Oliveira-dos-Santos, G. Van, A. Itie, et al 1999. OPGL is a key regulator of osteoclastogenesis, lymphocyte development and lymph-node organogenesis. Nature 397:315. Lomaga, M. A., W. C. Yeh, I. Sarosi, G. S. Duncan, C. Furlonger, A. Ho, S. Morony, C. Capparelli, G. Van, S. Kaufman, et al 1999. TRAF6 deficiency results in osteopetrosis and defective interleukin-1, CD40, and LPS signaling. Genes Dev. 13:1015. Li, J., I. Sarosi, X. Q. Yan, S. Morony, C. Capparelli, H. L. Tan, S. McCabe, R. Elliott, S. Scully, G. Van, et al 2000. RANK is the intrinsic hematopoietic cell surface receptor that controls osteoclastogenesis and regulation of bone mass and calcium metabolism. Proc. Natl. Acad. Sci. USA 97:1566. Lacey, D. L., E. Timms, H. L. Tan, M. J. Kelley, C. R. Dunstan, T. Burgess, R. Elliott, A. Colombero, G. Elliott, S. Scully, et al 1998. Osteoprotegerin ligand is a cytokine that regulates osteoclast differentiation and activation. Cell 93:165. Bucay, N., I. Sarosi, C. R. Dunstan, S. Morony, J. Tarpley, C. Capparelli, S. Scully, H. L. Tan, W. Xu, D. L. Lacey, et al 1998. Osteoprotegerin-deficient mice develop early onset osteoporosis and arterial calcification. Genes Dev. 12:1260. Tiffee, J. C., L. Xing, S. Nilsson, B. F. Boyce. 1999. Dental abnormalities associated with failure of tooth eruption in src knockout and op/op mice. Calcif. Tissue Int. 65:53. Xing, L., A. M. Venegas, A. Chen, L. Garrett-Beal, B. F. Boyce, H. E. Varmus, P. L. Schwartzberg. 2001. Genetic evidence for a role for Src family kinases in TNF family receptor signaling and cell survival. Genes Dev. 15:241. Dai, X. M., G. R. Ryan, A. J. Hapel, M. G. Dominguez, R. G. Russell, S. Kapp, V. Sylvestre, E. R. Stanley. 2002. Targeted disruption of the mouse colony-stimulating factor 1 receptor gene results in osteopetrosis, mononuclear phagocyte deficiency, increased primitive progenitor cell frequencies, and reproductive defects. Blood 99:111. Matsumoto, M., T. Sudo, T. Saito, H. Osada, M. Tsujimoto. 2000. Involvement of p38 mitogen-activated protein kinase signaling pathway in osteoclastogenesis mediated by receptor activator of NF-κB ligand (RANKL). J. Biol. Chem. 275:31155. Zhang, Y. H., A. Heulsmann, M. M. Tondravi, A. Mukherjee, Y. Abu-Amer. 2001. Tumor necrosis factor-α (TNF) stimulates RANKL-induced osteoclastogenesis via coupling of TNF type 1 receptor and RANK signaling pathways. J. Biol. Chem. 276:563. Aggarwal, B. B., A. Kumar, A. C. Bharti. 2003. Anticancer potential of curcumin: preclinical and clinical studies. Anticancer Res. 23:363. Singh, S., B. B. Aggarwal. 1995. Activation of transcription factor NF-κB is suppressed by curcumin (diferuloylmethane) [corrected]. J. Biol. Chem. 270:24995. Kumar, A., S. Dhawan, N. J. Hardegen, B. B. Aggarwal. 1998. Curcumin (Diferuloylmethane) inhibition of tumor necrosis factor (TNF)-mediated adhesion of monocytes to endothelial cells by suppression of cell surface expression of adhesion molecules and of nuclear factor-κB activation. Biochem. Pharmacol. 55:775. Plummer, S. M., K. A. Holloway, M. M. Manson, R. J. Munks, A. Kaptein, S. Farrow, L. Howells. 1999. Inhibition of cyclo-oxygenase 2 expression in colon cells by the chemopreventive agent curcumin involves inhibition of NF-κB activation via the NIK/IKK signalling complex. Oncogene 18:6013. Jobin, C., C. A. Bradham, M. P. Russo, B. Juma, A. S. Narula, D. A. Brenner, R. B. Sartor. 1999. Curcumin blocks cytokine-mediated NF-κB activation and proinflammatory gene expression by inhibiting inhibitory factor I-κB kinase activity. J. Immunol. 163:3474. Pan, M. H., S. Y. Lin-Shiau, J. K. Lin. 2000. Comparative studies on the suppression of nitric oxide synthase by curcumin and its hydrogenated metabolites through down-regulation of IκB kinase and NFκB activation in macrophages. Biochem. Pharmacol. 60:1665. Wei, S., S. L. Teitelbaum, M. W. Wang, F. P. Ross. 2001. Receptor activator of nuclear factor-κB ligand activates nuclear factor-κB in osteoclast precursors. Endocrinology 142:1290. Brockman, J. A., D. C. Scherer, T. A. McKinsey, S. M. Hall, X. Qi, W. Y. Lee, D. W. Ballard. 1995. Coupling of a signal response domain in IκBα to multiple pathways for NF-κB activation. Mol. Cell. Biol. 15:2809. Singh, S., B. G. Darnay, B. B. Aggarwal. 1996. Site-specific tyrosine phosphorylation of IκBα negatively regulates its inducible phosphorylation and degradation. J. Biol. Chem. 271:31049. Haridas, V., B. G. Darnay, K. Natarajan, R. Heller, B. B. Aggarwal. 1998. Overexpression of the p80 TNF receptor leads to TNF-dependent apoptosis, nuclear factor-κB activation, and c-Jun kinase activation. J. Immunol. 160:3152. Shevde, N. K., A. C. Bendixen, K. M. Dienger, J. W. Pike. 2000. Estrogens suppress RANK ligand-induced osteoclast differentiation via a stromal cell independent mechanism involving c-Jun repression. Proc. Natl. Acad. Sci. USA 97:7829. Kitaura, H., N. Nagata, Y. Fujimura, H. Hotokezaka, M. Tatamiya, N. Nakao, N. Yoshida, K. Nakayama. 2003. Interleukin-4 directly inhibits tumor necrosis factor-α-mediated osteoclast formation in mouse bone marrow macrophages. Immunol. Lett. 88:193. Chaturvedi, M. M., R. LaPushin, B. B. Aggarwal. 1994. Tumor necrosis factor and lymphotoxin: qualitative and quantitative differences in the mediation of early and late cellular response. J. Biol. Chem. 269:14575. Manna, S. K., A. Mukhopadhyay, B. B. Aggarwal. 2000. Leflunomide suppresses TNF-induced cellular responses: effects on NF-κB, activator protein-1, c-Jun N-terminal protein kinase, and apoptosis. J. Immunol. 165:5962. Rothwarf, D. M., M. Karin. 1999. The NF-κB activation pathway: a paradigm in information transfer from membrane to nucleus. Sci. STKE 1999:RE1. DiDonato, J. A., M. Hayakawa, D. M. Rothwarf, E. Zandi, M. Karin. 1997. A cytokine-responsive IκB kinase that activates the transcription factor NF-κB. Nature 388:548. Uhlik, M., L. Good, G. Xiao, E. W. Harhaj, E. Zandi, M. Karin, S. C. Sun. 1998. NF-κB-inducing kinase and IκB kinase participate in human T-cell leukemia virus I tax-mediated NF-κB activation. J. Biol. Chem. 273:21132. Russo, M. P., B. L. Bennett, A. M. Manning, D. A. Brenner, C. Jobin. 2002. Differential requirement for NF-κB-inducing kinase in the induction of NF-κB by IL-1β, TNF-α, and Fas. Am. J. Physiol. 283:C347. Iotsova, V., J. Caamano, J. Loy, Y. Yang, A. Lewin, R. Bravo. 1997. Osteopetrosis in mice lacking NF-κB1 and NF-κB2. Nat. Med. 3:1285. Franzoso, G., L. Carlson, L. Xing, L. Poljak, E. W. Shores, K. D. Brown, A. Leonardi, T. Tran, B. F. Boyce, U. Siebenlist. 1997. Requirement for NF-κB in osteoclast and B-cell development. Genes Dev. 11:3482. Jimi, E., I. Nakamura, T. Ikebe, S. Akiyama, N. Takahashi, T. Suda. 1998. Activation of NF-κB is involved in the survival of osteoclasts promoted by interleukin-1. J. Biol. Chem. 273:8799. Kanegae, Y., A. T. Tavares, J. C. Izpisua Belmonte, I. M. Verma. 1998. Role of Rel/NF-κB transcription factors during the outgrowth of the vertebrate limb. Nature 392:611. Boyce, B. F., L. Xing, G. Franzoso, U. Siebenlist. 1999. Required and nonessential functions of nuclear factor-κB in bone cells. Bone 25:137. Ozaki, K., Y. Kawata, S. Amano, S. Hanazawa. 2000. Stimulatory effect of curcumin on osteoclast apoptosis. Biochem. Pharmacol. 59:1577. David, J. P., K. Sabapathy, O. Hoffmann, M. H. Idarraga, E. F. Wagner. 2002. JNK1 modulates osteoclastogenesis through both c-Jun phosphorylation-dependent and -independent mechanisms. J. Cell Sci. 115:4317. Chen, Y. R., T. H. Tan. 1998. Inhibition of the c-Jun N-terminal kinase (JNK) signaling pathway by curcumin. Oncogene 17:173. Takayanagi, H., K. Ogasawara, S. Hida, T. Chiba, S. Murata, K. Sato, A. Takaoka, T. Yokochi, H. Oda, K. Tanaka, K. Nakamura, T. Taniguchi. 2000. T-cell-mediated regulation of osteoclastogenesis by signalling cross-talk between RANKL and IFN-γ. Nature 408:600. Abu-Amer, Y.. 2001. IL-4 abrogates osteoclastogenesis through STAT6-dependent inhibition of NF-κB. J. Clin. Invest. 107:1375. Hayashi, T., T. Kaneda, Y. Toyama, M. Kumegawa, Y. Hakeda. 2002. Regulation of receptor activator of NF-κB ligand-induced osteoclastogenesis by endogenous interferon-β (IFN-β) and suppressors of cytokine signaling (SOCS): the possible counteracting role of SOCSs in IFN-β-inhibited osteoclast formation. J. Biol. Chem. 277:27880. Takayanagi, H., S. Kim, K. Matsuo, H. Suzuki, T. Suzuki, K. Sato, T. Yokochi, H. Oda, K. Nakamura, N. Ida, et al 2002. RANKL maintains bone homeostasis through c-Fos-dependent induction of interferon-β. Nature 416:744. Manna, S. K., B. B. Aggarwal. 1998. Interleukin-4 down-regulates both forms of tumor necrosis factor receptor and receptor-mediated apoptosis, NF-κB, AP-1, and c-Jun N-terminal kinase: comparison with interleukin-13. J. Biol. Chem. 273:33333. Singletary, K., C. MacDonald, M. Wallig, C. Fisher. 1996. Inhibition of 7,12-dimethylbenzanthracene (DMBA)-induced mammary tumorigenesis and DMBA-DNA adduct formation by curcumin. Cancer Lett. 103:137. Shao, Z. M., Z. Z. Shen, C. H. Liu, M. R. Sartippour, V. L. Go, D. Heber, M. Nguyen. 2002. Curcumin exerts multiple suppressive effects on human breast carcinoma cells. Int. J. Cancer 98:234. Rodan, G. A., T. J. Martin. 2000. Therapeutic approaches to bone diseases. Science 289:1508.